Tuxedo and his pals lived on the edge between divergent classes of funny animals. They were neither fully anthropomorphic, like Mickey Mouse and Augie Doggie (i.e., living in houses and otherwise functioning exactly like oddly-shaped humans), nor completely animal-like, such as Humphrey Bear or Tom & Jerry. They walked on their hind legs and conversed with animal and human alike, but otherwise functioned as animals. This particular set lived in the Megopolis Zoo. Besides Tennessee (a penguin), the zoo dwellers included Chumley (a walrus, and Tennessee's best pal), Baldy (an eagle) and Yakkety (a yak). 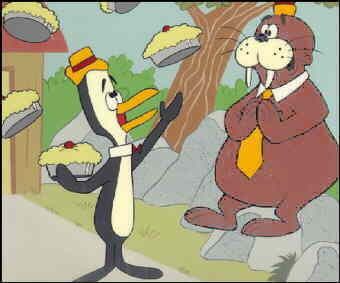 Chumley's voice was provided by Bradley Bolke (several incidental characters in Casper the Friendly Ghost's 1963 TV series), Baldy's and Yak's by Kenny Delmar (whose radio character, Senator Claghorn, Mel Blanc based Foghorn Leghorn on) and Tennessee's by Don Adams (who later became famous as Maxwell Smart and still later used his "Smart" voice as Inspector Gadget). Delo States, who did miscellaneous voices for the studio, was Stanley Livingston (the zoo keeper), and Larry Storch (who also did voices at Warner Bros. during the last few years of its animation studio) did Phineas J. Whoopee (whose reason for always being handy wasn't entirely clear). Stories usually involved some ambitious scheme of Tennessee's, aided by Chumley, tho the latter, like Davey's Goliath or Yogi Bear's Boo-Boo, would be skeptical; while keeper Livingston tried vainly to maintain order. Things would eventually be set right with information provided by Mr. Whoopee, who had an animated chalkboard for visual aid. Mr. Whoopee's lectures also imparted useful or interesting knowledge to the viewers, in a reasonably painless way. The show debuted Saturday, September 28, 1963, on CBS. The studio producing it was Leonardo Productions (formerly Total Television, now re-named after its first success, King Leonardo & His Short Subjects). The same studio was later responsible for Underdog. Tennessee Tuxedo himself starred in the first of three segments in each half-hour episode. The other two featured a variety of stars during the three years the show remained in production — Klondike Kat, Commander McBragg, King Leonardo, Tooter Turtle and The Hunter (the last three re-run from the old King Leonardo show). The McBragg segment was later re-run on Jay Ward's Hoppity Hooper show. More than 60 episodes were made between 1963 and '66, when CBS dropped it from the Saturday morning schedule. Some of them were re-run on ABC during the last half of 1966, and they've occasionally been syndicated since then. They were most recently seen on Nickelodeon in the early 1990s. The characters were never adapted into comic books or other story media, tho they've had their share of licensed merchandise. Several episodes were released on videotape during the 1990s, but nowadays, even those are getting hard to find. Text ©2002-06 Donald D. Markstein. Art © Leonardo Productions.